“Jesse James Movie ” release date was pushed back more than a year by its distributor, Warner Bros. But don’t take that as a bad thing with this title. The Warner Bros. film was also pushed back more than a year and it went on to win the 2007 Best Picture and Director Oscars. Jesse James (BRAD PITT) was one of the country’s first bona fide celebrities. There have been countless books written and tales told about America’s most famous outlaw–all of them colorful and fascinating, all focused on his larger-than-life public persona and daring exploits, and most of them bearing only incidental reference to the truth. To those he robbed and terrorized, and to the families of those he admittedly killed, he may have been just a criminal, but in the sensational newspaper articles and dime novels chronicling the James Gang throughout the 1870s, Jesse was the object of awe and admiration. He was a Robin Hood, they suggested, targeting railroad owners and banks that exploited poor farmers. He was a man with a tragic cause, a wronged and wounded Confederate soldier striking back against the Union that had ruined his life. Most importantly, to an increasingly buttoned-down and citified population leading ordinary lives, he was the last frontiersman–a symbol of freedom and the American spirit, a charismatic rebel who flouted the law and lived by his own rules…by all accounts, a legend. Foremost among his admirers was Robert Ford (CASEY AFFLECK), an idealistic and ambitious young man who had devoted his life to the hope of one day riding alongside his idol. He could never have imagined that history would ultimately mark him as the “the dirty little coward” who shot Jesse in the back. But who was Jesse James, really–behind the folklore and the selling of newspapers? And who was Robert Ford, just nineteen and a member of Jesse’s inner circle, who was able to bring down such a formidable figure when lawmen across ten states had tried and failed? How did they come to be friends and what happened between them in the days and hours leading up to the gunshot that would end one man’s life and become the definition and sum total of another’s? No one will ever know the whole truth. 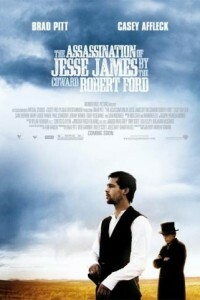 Based on the novel by Ron Hansen, “The Assassination of Jesse James by the Coward Robert Ford” delves into the private lives of America’s most notorious outlaw and his unlikely assassin to offer a new perspective on a legend and address the question of what really may have transpired in the months before that infamous shooting. The year is 1881 and Jesse is 34 years old. As he plans his next great robbery, he continues to wage war on his enemies who are trying to collect the reward money and the glory riding on his capture. But the greatest threat to his life could come from those he would trust the most. A biography of the first Director of the FBI. J.